Kartell, founded in 1949, was one of the first companies in Europe to begin transforming plastic materials and using them to create and produce designer furniture, furnishing objects and household accessories. In the last 60 years Kartell’s main objective has been to take the technological and industrial aspects of plastic - a consideration necessary in today’s economic and social environment - and combine them with a cultural and aesthetic approach. At the end of the 1950’s this technological development led naturally to the birth of the Kartell Labware Division, a section of Kartell that supplies products specifically for the laboratory market. 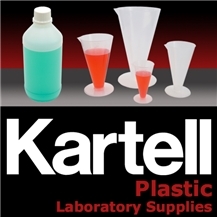 Stocked in our Rochester, NY facility, Kartell's plastic lab supplies are in house and ready to ship for your reusable and single use plastic laboratory needs!